Mix colours to see which colours mask others and how they combine to make new colours. Add a drops of colours to the tray and look for new colours. 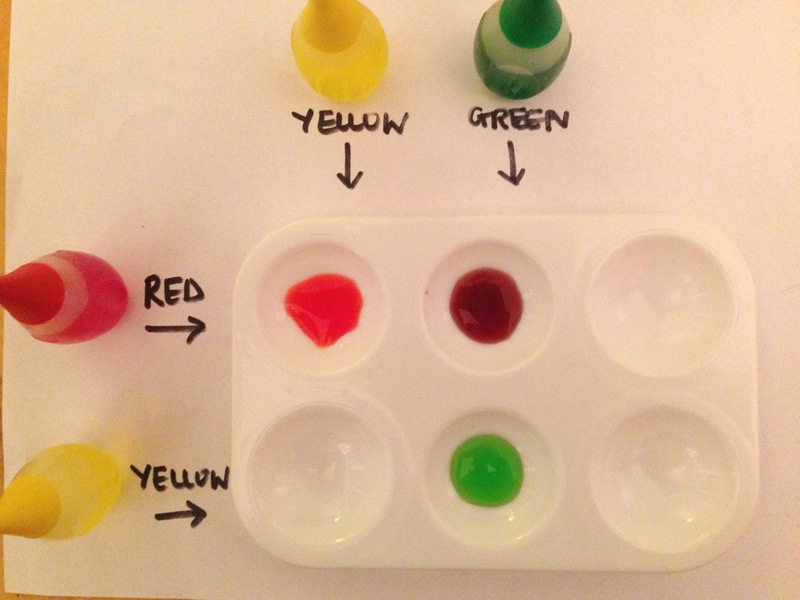 Use only yellow, red and green dyes. Look for which colours can mask others - see attached worksheet. The yellow is masked by both green and red. A yellow pigment is always in green leaves, but is usually masked by the green pigment. In the fall, when the green pigment decays, the yellow is revealed, turning Fall leaves golden. Red fall leaves also have yellow pigment. In these leaves the green pigment has decayed and new red pigment is made. The yellow is still hidden under the red, though sometimes leaves look orange when there is less red pigment and the yellow shows through a little.